Fresh out of the Garvel Drydock at Greenock, the Dover-registered dredger ADMIRAL DAY was seen as she made her way back to Fleetwood. 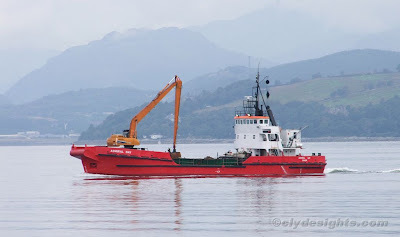 She was recently employed at Largs pier, where she was dredging material and then dumping it at the mouth of Loch Long. During her docking, her hull has been repainted into Wyre Marine Services' red colour scheme.